John Deere Limited celebrates its 50th anniversary in the UK and Ireland in 2016, beginning with a special display at LAMMA in January. The company started trading from Langar in January 1966, and the original premises are still in use today as John Deere’s visitor centre and national parts distribution centre. One of the tractors sold by John Deere dealers 50 years ago, and on which the company started to build its reputation, was the 4020 Diesel. This 91hp six-cylinder tractor was the first to appear on the UK market with a powershift transmission and became arguably the most popular tractor of its era. 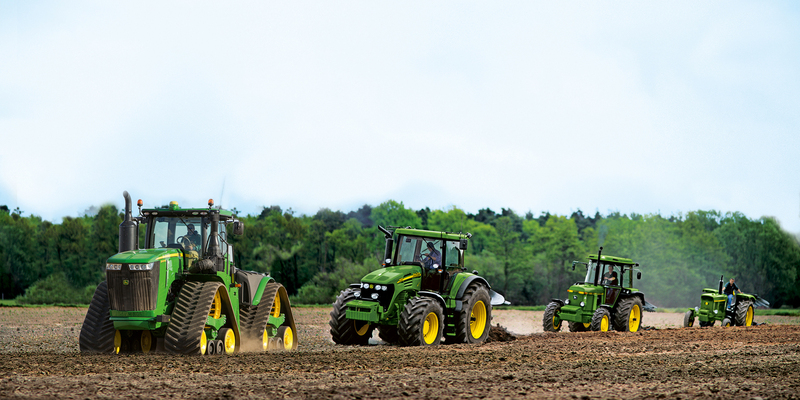 The rest of the John Deere Limited product line in 1966 included the 710, 5010 and 5020 tractors, ploughs, cultivators, disc harrows and the 530 and 630 combines. Langar’s own specially restored 4020, nicknamed BEV after its original registration plate, played a starring role in last November’s Lord Mayor’s Show in London, helping the Worshipful Company of Farmers and the NFU to promote the Back British Farming campaign. In a nod to the 2016 anniversary, it was chosen to parade alongside its modern day descendant, the new flagship 620hp four-track 9620RX, to highlight just one aspect of the tremendous advances that have been made in farming technology over the last 50 years. Classic John Deere tractor and machinery owners visiting LAMMA 2016 also had an early chance to register their machines for this field-based event, which aims to gather together examples of John Deere products sold through the company’s UK and Irish dealers during the period 1966 to 2016. There will be demonstration and working plots for those who would like to bring implements (preferably made by John Deere) and use them, plus parades and prizes. Owners of old and new John Deere machines are encouraged to submit an application form for the event, which were available on the John Deere stand at LAMMA and are now downloadable from this website.